Oceans are gradually becoming warmer and more acidic as more carbon dioxide enters the atmosphere — two shifts that are altering the economic foundations of many coastal regions. In a new study published in Nature Climate Change, we and our colleagues set out to identify hotspots around the United States for ocean acidification. We found the impact is most likely to be substantial in coastal communities that depend heavily on shellfish harvests and where resources and knowledge to guard against harvest losses are low. Communities facing environmental changes often don’t know where or how to start adapting for the future. Typically, when it comes to ocean changes that affect marine harvests, coastal communities have a hard time planning for the next decade. This year and the next are difficult enough, with ever-changing markets, rules on how much seafood can harvested, and natural variability in the fish and shellfish stocks themselves. Ocean acidification and warming, which are playing out over long timeframes, makes it even more difficult to plan. Yet, coastal communities need to start preparing. Ocean acidification robs bivalves of their ability to quickly grow protective shells and causes other problems for shellfish. The oyster industry in the Pacific Northwest, for example, has been hard-hit in the past ten years by ocean acidification. Natural upwelling of waters soured by ocean acidification drove multiple years of larval oyster die-offs in hatcheries there, jeopardizing a $272 million industry that supports more than 3200 jobs. Our study synthesized data from ocean models, river and estuary databases, shellfishery harvest records, and social information, such as the diversity of job opportunities and the proximity of marine research centers. Compiling this data in geospatial mapping software allowed us to make regional comparisons between areas that hadn’t previously been evaluated using the same types of measurements. All the risk factors in our study shown together. Upwelling, river discharge, and nutrient pollution worsen ocean acidification. Meanwhile, ocean acidification continues to grow due to atmospheric carbon dioxide levels, and it will reach a critically harmful point for shellfish larvae at different dates around the country (gray tones). On land, dependence on shellfish harvests and communities’ ability to cope can be combined into economic vulnerability score (red tones). The good news is that no single community has the triple threat of substantial ocean acidification, heavy dependence on shellfish harvests, and little knowledge and community resources. But the bad news is that many communities have two out of three of these factors, making ocean acidification a nationwide problem. This study shows us that vulnerability to ocean acidification is a more nuanced issue than we’ve previously thought. Not only does it depend on oceanographic factors, but it also depends on social factors, including how connected local industry is to environmental monitoring and research efforts. 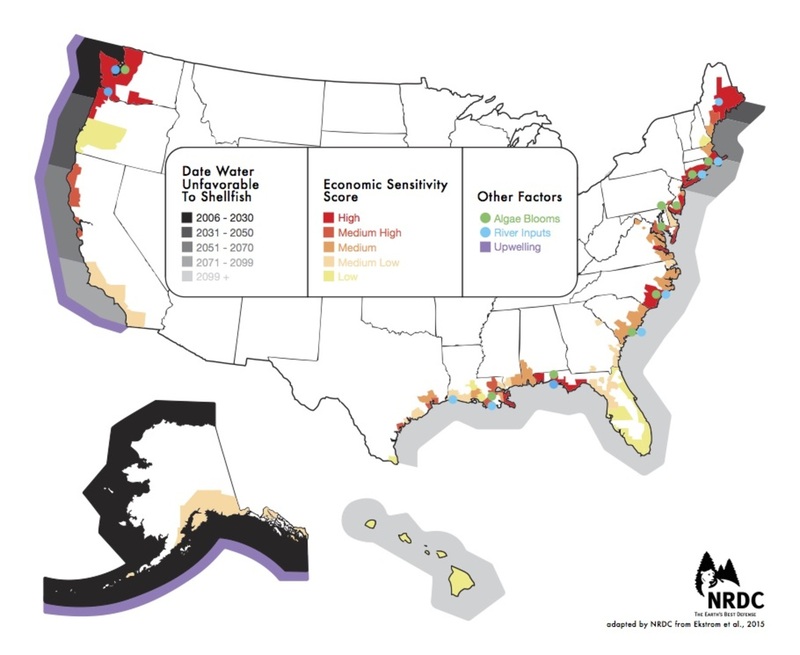 These factors affect how nimble a shellfish-dependent community will be in developing adaptations against ocean acidification, whether it has already appeared – as in the Pacific Northwest – or it is yet to arrive, as is the case in most other areas of the nation. Finding ways to future-proof coastal communities against ocean acidification is beginning, as individual states, including Washington, Maine and Maryland, convene panels to assess the local implications of ocean acidification and consider what needs to be done. It’s clear from our study and from the conclusions of emerging state panels that preparing for ocean acidification’s impacts will involve regionally specific actions. Aquaculture will need to adapt in different ways because of ocean acidification. Some areas need to work on fixing the things that worsen ocean acidification, like fertilizer pollution. Other areas need to build stronger networks for sharing knowledge and ideas for sidestepping the worst of ocean acidification’s impacts. Communities with strong links among researchers, industry, and resource managers, like those in Oregon and Washington State, have very nimbly built partnerships for monitoring and improving water quality in hatchery tanks. These adaptations have already prepared this industry to offset immediate losses from acidification. Still other areas may need to think of ways to diversify harvests, or culture larvae (usually the most sensitive life stage) in protected environments. More investment in ocean acidification research will not only shed more light on the “when, where, and how bad” questions that are on everyone’s minds, but it will also support the development of needed social information-sharing networks that are critically needed to prepare communities for ocean acidification. It’s the right time to make these investments, as planning for the future always works better before a crisis begins. Sarah Cooley is Guest investigator at Woods Hole Oceanographic Institution. Julia Ekstrom is Climate Adaptation Program Director, Policy Institute for Energy, Environment, and the Economy at University of California, Davis.